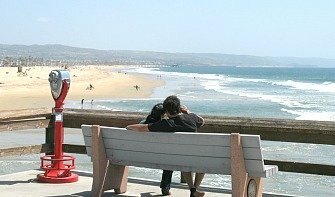 Fun Romantic Getaways in Texas – Beaches, B&B’s, and Travel Ideas for Couples. Here’s our guide to travel in Texas for two! The Lone Star State is huge (800 miles across each way), so we’ll just cover a few of the highlights here for a romantic getaway or weekend. Planning Your Romantic Getaways in Texas – The best time to visit Texas would be either the spring (wildflowers blooming!) or fall, when temps are moderate. The summers can get very hot, with high humidity. The San Antonio River Walk - it's like a small slice of Venice, Italy in downtown San Antonio! Shops and restaurants crowd along the tree-lined canal and promenade, with historical sites like the Alamo and La Villita just a short walk away. You can pile on with the tourist crowds for a river barge tour, but just being here is the best part. Tip: From May to early September, it can feel like 1/2 of Texas is "Walking the Walk" with you! Try late afternoon or later in the evening (after 9 PM) for a romantic stroll along the canal. 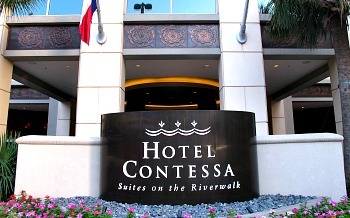 Romantic Restaurants on the San Antonio River Walk: try to land a water-side table for two along the River Walk. 2 options we like on the quieter west side: Southern cuisine with a flair is nearby at Biga on the Banks (203 S. St. Mary's St, 210-225-0722), one of the best restaurants in the San Antonio River Walk. Or just a little further east along the Walk fronting the Westin Riverwalk Hotel is Zocca (420 W. Market St, 210-444-6070) with their mouthwatering shrimp pesto pizza. If you think the rural part of the state is just one big dry desert, think again. Texas Hill Country stands out as one of the prettiest areas of the Southwest. Where is it? Imagine a triangle of sorts between Austin, Fredericksburg and San Antonio filled with meadows and streams, rolling hills and interesting towns. Fredericksburg, TX Romantic B&B's - spend a night or two at a great B&B in this attractive, Bavarian-style town, “deep in the heart of Texas”. There's a number of day spas in the area if you'd like to really relax, or just do what we did and explore main street, checking out the shops (really friendly folks here! 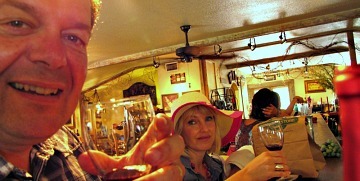 ), sampling German sausage and tasting some local wines. 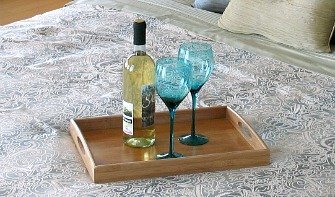 New Braunfels Vacation Rentals - affordable and romantic accommodation in condos, hotels and cabins, perfect for exploring the area. 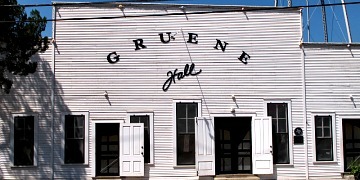 See restored and terrific Gruene Hall (America's oldest dance hall), plus check out wine tasting and antiques. Just park your car near the corner of Hunter & Gruene Rds and walk to everything. Texas Hill Country Wine Trail - a collection of 16 wineries that have special events, tastings, etc. If you've got a car, this makes a nice road trip. Bandera, TX - this little town northwest of San Antonio calls itself the Cowboy Capital of the world, and they're not kidding! You gotta see it! 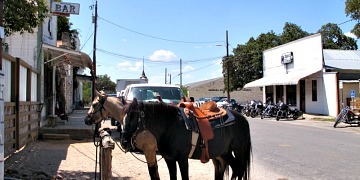 Saddle shops, saloons, horses parked alongside trucks, and some wild-west diners. Barton Springs Pool: get relief from Austin’s city heat with this springs at 2102 Barton Springs Rd. We came down for a plunge on a hot Saturday afternoon in July, and it was just crawling with people. So we recommend try this location on a quieter weekday afternoon during summer. Cost was $3 per adult. 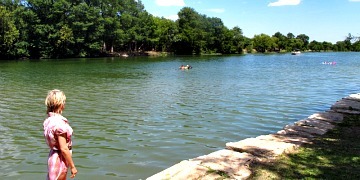 Kerrville-Schreiner Park: enroute from Austin to San Antonio on our tour of Texas Hill Country, we stopped for a fantastic ½ hr swim in refreshing water of the Guadalupe River. Peaceful and shady, with easy access off the Hwy. 2012 park entry rates: $4 per person. The staff were great, they even gave us a 30 min pass for free to try it out! Located on Hwy 173 just south of Kerrville, TX. 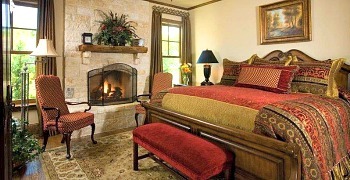 Texas Honeymoon Hotel Suites & Packages - more than just a weekend getaway in the Lone Star State? If you're planning a vacation together here right after your wedding day, check out our brand new 2016 guide to the most romantic honeymoon hotels and packages in great spots like San Antonio, Houston, Dallas, Austin and the Texas Gulf Coast. 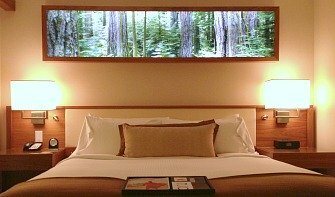 Romantic Travel in Arkansas - what to see and where to stay for getaways in Arkansas. Dallas/Ft. Worth might be the first stop on your Texas romantic getaway if you fly here. Avant garde Deep Ellum is a cool collection of cafes, dance clubs, coffee houses and one-of-a-kind shops. The Sixth Floor Museum at Dealey Plaza, the site of the Kennedy Assassination, is a must-see Dallas attraction, as is the Fort Worth Stockyards, for a good dose of cowboy culture and the romantic west! Romantic Restaurants in Dallas/Fort Worth: Looking for a quieter place to enjoy some tasty ribs? TryThe Grape (2808 Greenville Ave). If you’re in the mood for something more Parisian, the French Room inside the Adolphus Hotel has been rated as perhaps Dallas most romantic dining. 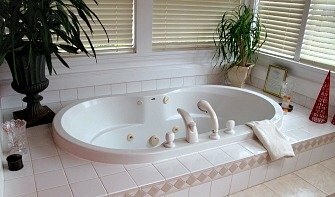 Romantic Hot Tub Suites in Texas - selection of hotels with private in-room Whirlpool tubs in Dallas, Houston, San Antonio, Austin TX and more. South Congress: there's a saying down here: "Keep Austin Weird." And South Congress does it in a fun way! If you're from out of state (like us), this entertaining strip just south of the city center will dispel a lot of myths you might have about Texas and Texans. You can eat in (big choice of restaurants) or out (food trucks), and snoop around some very eclectic stores, art retailers, pubs and clubs with promotions like "Hippie hour"! 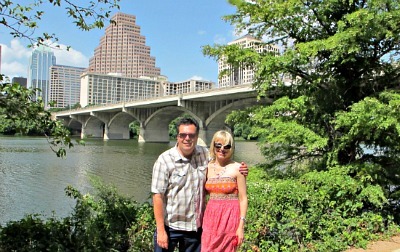 Romantic Walk in Austin: if you want a nice stroll along the water, Lady Bird Lake Trail is an obvious choice. There's great views of the city, and if you'd rather be on the water instead of beside it, you can get on a boat tour or even rent water bikes just in front of the Hyatt Hotel. Marker 10 at the Hyatt Hotel: Superb patio bar on the edge of Lady Bird Lake – great place to wind down under the shady trees after a long day. 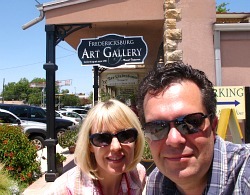 If Austin is your weekend getaway destination, an interesting stop along Hwy 290 is Brenham, TX (about ½ way). The historic downtown is good for a quick explore (Maureen found a great second-hand book store), and we ducked into Must Be Heaven (107 W Alamo) for some of their delicious Dutch apple pie with ice cream! Hermann Park - a nice patch of green near downtown Houston. Couples can spend time by the Reflection Pool, see the Houston Zoo, or rent a paddle boat for two on McGovern Lake. Galveston Island – Gulf coast beaches plus a whole range of amusements, activities, restaurants and accommodation. Other romantic places in Houston include the Montrose District and it’s eclectic assortment of eateries, galleries, shop and nightclubs. There’s also shopping and entertainment at Bayou Place. Art lovers will appreciate the Museum of Fine Arts and the Menil Collection. Dining for Two: For Romantic Restaurants in Houston, just around the corner from Montrose District is Westheimer Rd, where a very romantic “fondue for two” awaits in the booths of the Melting Pot (6100 Westheimer Rd). Mark’s American Cuisine (1658 Westheimer Rd) with its gorgeous dining hall has been voted the most romantic restaurant in Houston. 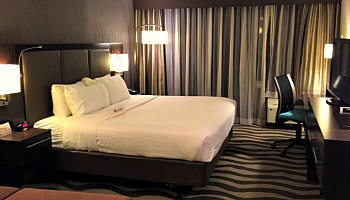 Romantic Houston Hotels - what's the best place to stay for your romantic getaways in Texas' largest city, Houston? 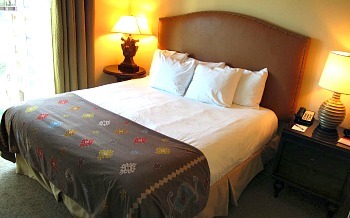 Find out here in our Guide to Romantic Houston TX Hotels. 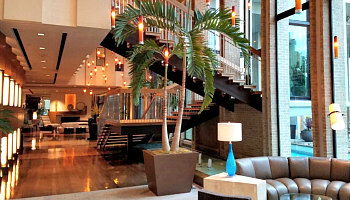 You'll see 3 terrific boutique hotels in downtown Houston, plus an affordable inn a little further out that's got a great pool and an awesome mid-week deal! South Padre Island – gets swamped during spring break, but otherwise is one of Texas’ top beaches for sand, warm water and swimming. Lots for dining and entertainment too. Two Ton Tuesdays - June to Mid August, Gruene, TX - dance lessons and good times rock-a-billy live music all start at 6 PM at the legendary Gruene Dance Hall. Deep Ellum Market - Saturdays in Dallas TX - check out the crafts, clothing, food, art and entertainment at this great neighborhood flea market, one of the best of it's kind in Texas.